This collection of previously unpublished essays from a diverse range of well-known scholars and architects builds on the architectural tradition of phenomenological hermeneutics as developed by Dalibor Veseley and Joseph Rykwert and carried on by David Leatherbarrow, Peter Carl and Alberto Pérez-Gómez. Given the recent fascination with all things digital and novel, what is the role of history and theory in contemporary architectural praxis? Is authentic meaning possible in a technological environment that is so global and interconnected? What is the nature and role of the architect in our shared modern world? How can these questions inform a new model of architectural praxis? 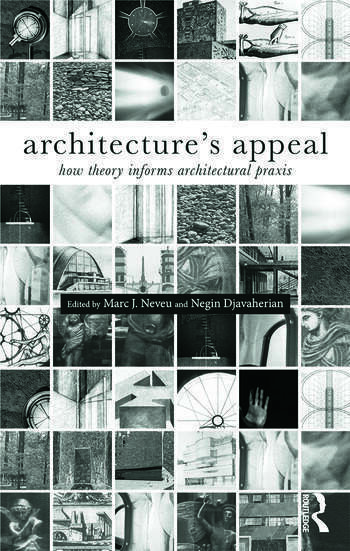 Architecture's Appeal is a thought-provoking book which will inspire further scholarly inquiry and act as a basis for discussion in the wider field as well as graduate seminars in architectural theory and history. Acknowledgements. Introduction Marc Neveu and Negin Djavaherian Part 1: Invoking the Gods 1. The Reading Chamber Robert Kirkbride 2. The Tower of Babel and Jacob's Pillar: Hegel, Heidegger, and the Death of Architecture Karsten Harries 4. Reading What is Written Between the Lines: The Esoteric Dimension of Ebenezer Howard's Garden Cities of To-Morrow Paul Emmons 4.On Virtue and Thomas Jefferson Indra Kagis McEwen Interlude A: The Architect's Fall Santiago de Orduña Part 2: Worldmaking 5. Made in Usage: Architecture in Furetière’s Dictionnaire Universel Caroline Dionne 6. Beyond Expression Lily Chi 7. On Water and Other Fluids: A Bloody Account of Urban Circulation Louise Pelletier 8. Earth or World? Aerial Image and the Prosthetic Imagination Lawrence Bird Interlude B: The Door of Theory Marco Frascari Part 3: Flesh/Eros 9. Tough Love: A Study of the Architecture of Pezo von Ellrichshausen David Leatherbarrow 10. Flesh of Stone: Buildings, Statues, Entangled Bodies Tracey Eve Winton 11. Genius as Eros Lian Chikako Chang 12. The Tactile Legacy of Alvar Aalto and its Relevance to Contemporary Practice Kenneth Frampton Interlude C: Sigmund Freud or the Dark Forest Room Revisited Natalija Subotincic Part 4: Fusion of Horizons 13. Voices of Tranquility: Silence in Art and Architecture Juhani Pallasmaa 14. An Architectural Creation Myth Borrowed from the Phenomenology of Music Stephen Parcell 15. Modus Operandi of an Architectus Doli: Architectural Cunning in the Comic Plays of Plautus Lisa Landrum 16. Towards an Ecology of the Palladian Villa Graham Livesey Interlude D: Transformative Power of Architecture Steven Holl Part 5: After the Crisis 17. Juan O'Gorman and the Genesis and Overcoming of Functionalism in Mexican Modern Architecture Juan Manuel Heredia 18. Architecture or Acceleration: Position as Opposition Anne Bordeleau 19. Building Upon Love in an Age of Innovation Peter Olshavsky 20. Content and Craft: What do we do when we do the History of Architecture? David Theodore Interlude E: Two Poems 2000-2011 Ricardo L. Castro List of Figures. List of Contributors. Marc J. Neveu is Chair of the Department of Architecture at Woodbury University, Los Angeles, USA, and the Executive Editor of the Journal of Architectural Education. Negin Djavaherian is an independent scholar currently residing in Montréal, Canada.